Sensitive and delicate tissue of central nervous system (brain and spinal cord) needs suitable environment for its normal activity. That is why in one side it needs selective transport of essential substances from blood capillaries to extracellular space of nervous tissue and again it needs restriction of entry of some injurious and toxic substances. This becomes possible only because of presence of a barrier between capillary lumen and extracellular space of nervous tissue. This is called blood-brain barrier. Though it is called ‘blood-brain barrier’ it demarcates blood from brain as well as spinal cord. restriction because endothelial lining presents ‘tight junction’ and it is devoid of typical fenestrations. Basement membrane: Outside the endothelial cells, there is continuous layer of basement membrane. Foot processes of astrocytes: Surrounding the capillary wall and closely apposed to it, there are numerous foot processes of astrocytes. Blood-brain barrier is impermeable to compound having molecular weight of 60,000 or more. It follows transport of gases and water readily. Lipid-soluble substances are able to pass through. The barrier permits transport of glucose, electrolytes, amino acids but prevents access of protein. Toxic materials are prevented from passing through the barrier. 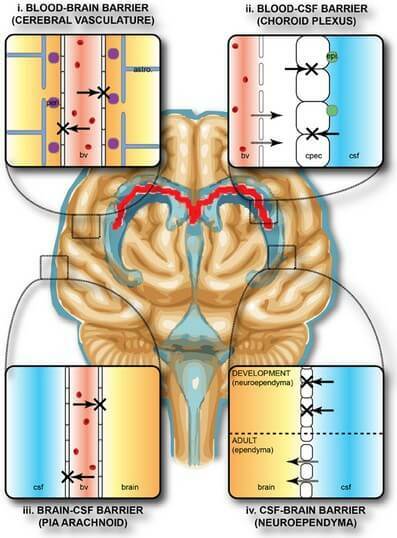 Blood-brain barrier has got enormous importance in connection with drug therapy and induction of anesthesia. To have an effect on central nervous system tissue, a drug for treatment of a disease, must have ability to pass through blood-brain barrier. Area postrema in the floor of fourth ventricle. Blood-brain barrier in newborn needs special mention. Although it exists very well in newborn, there are evidences that it is more permeable to certain substances than in case of adults.